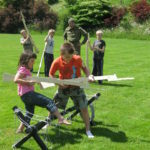 The assault course requires about 30 m x 10m on level, mowed Grass, without rabbit holes or other trip hazards. 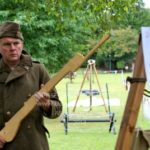 In groups of 6 maximum, children are issued plastic ww2 type helmet, armband & dummy wooden rifle. They receive a drill lesson by a WW2 soldier, & a demonstration of how to tackle the obstacle course ahead. 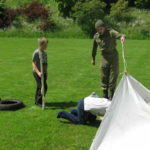 They have to carry/roll a lorry tyre around the course, going over imitation barbed wire fences, under tarpaulin, through car tyres, avoid ‘minefield’, poke the stuffed sack at the end of the course with the ‘rifle bayonet’ and hang onto a rope for a count of 10 with both feet off the ground. Other obstacles may be added as space/time permits. Machine -gun sounds /explosions /aircraft noises may be played via our PA system. Each group of 6 should take 15 minutes so a maximum of 120 during a day approx. • Those suffering from a previous medical condition which prevents sport activities including loud noises. We allow 90 minutes for unloading, setup and safety checks.